She's Sew Crafty: It's Blog Hop Time!! Our monthly blog hop time is here! Our lovely host is...Vili! She has chosen the theme of ...Birthday! 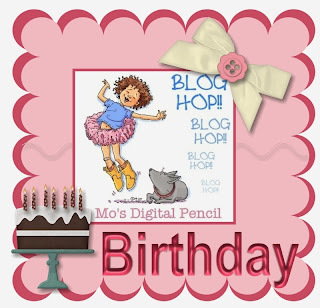 Make sure to leave comments on the blogs along the hop for a chance to win one of two $5 store credits for Mo's Digital Pencil!! I decided to make one of my sons a birthday card using the Video Boy image. This is totally my oldest son. He knew it, too, when he saw it! I had fun stenciling some stars and circles on the background paper and I used my molded stars to embellish. Okay, so you should have came here from Anneke's blog and your next stop from here is Kaly! wonderful card for a tough boy!! This is a great Boys birthday card, very nice. ..always nice to see a cool card for the boys! Beautiful card, Danielle! Very nice details and great coloring. Oh WoW! I LOve this image...Just what my Grandson's would be doing most of the time if they could! FABulous colours. LOving your embellishments and perfect sentiments. 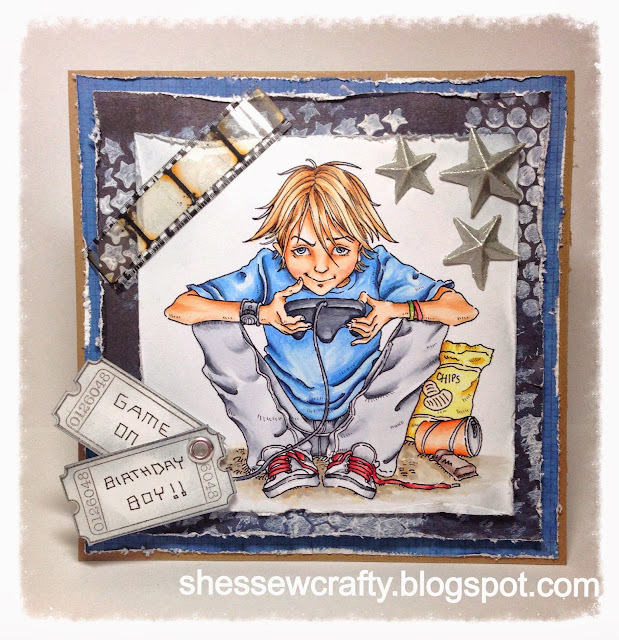 Great boy card you do not see enough of them.Beautifully done. Super card. I like that image very much. Boy cards are hard, but this one is spot on. Wat een gave kaart, heb deze afbeelding ook , gekocht voor mijn zoon, maar al zoveel keren gebruikt voor andere 'stoere' mannen. It can be a real challenge to make a card for a male (young or old)...this image and card would be perfect for many age groups. Beautifully coloured fun image and card! Great guy card, Danielle! Terrific coloring and design! Interesting choice for a v-day card, but that makes it more special! The card is just awesome! The perfect "boy" card! Great card and details! Fabulous!! Such a great image, wonderful colouring and brilliant detailing too. Great card for a boy! colors are masculine, but not too much!! It's nice to see a "boy" card among all the frilly, girly stuff! You don't see many make cards around but this one is fabulous and your colouring is just astounding! Great masculine card - love the distressed papers. Mo has some great images and this is another one of my favs! I love how you shaded his skin and his jeans especially! Glad your son loved it too!! That is one beautiful card.... I love it! Such a cool card!! Love your coloring! Kenny K New Christmas Release! !